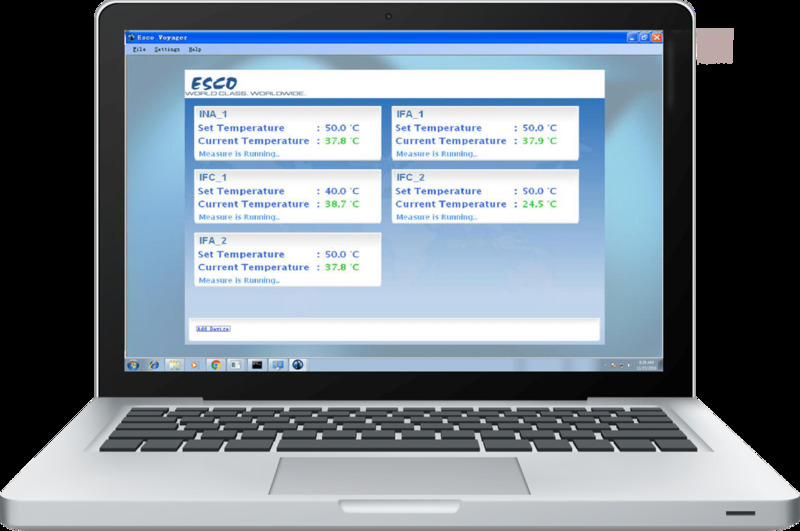 Esco Voyager® is a PC-based software package developed for the remote monitoring, datalogging, and programming / device configuration of Esco controlled environment laboratory equipment. Compatible equipment includes laboratory ovens and microbiology incubators. Voyager® interfaces with individual Esco equipment over RS485 using the EscoBUS communications protocol. Up to 16 devices of equipment may be interfaced to a single PC. Automatic, continuous monitoring of device parameters (Temp, CO₂, RH, etc.) to validate instrument performance and assay criteria. Allows a single researcher to view and graph MULTIPLE device parameters remotely in real-time. Saving and exporting log data in various formats from multiple instruments. Automatic emailing of log data at user-defined intervals. Download of data logs from equipment memory (only for devices with built-in data logging memory, i.e. CO₂ Incubators). Voyager® can activate an alarm if a user-defined parameter limit is exceeded. When an alarm condition occurs, Voyager® can automatically send email alerts to protect precious samples or experiments. Documentation of all alarms with time/date stamp. Voyager® allows for easier program development with a simpler graphical user interface. Voyager® software can download user programs to multiple Esco instruments easily insuring consistent experiments on multiple devices.